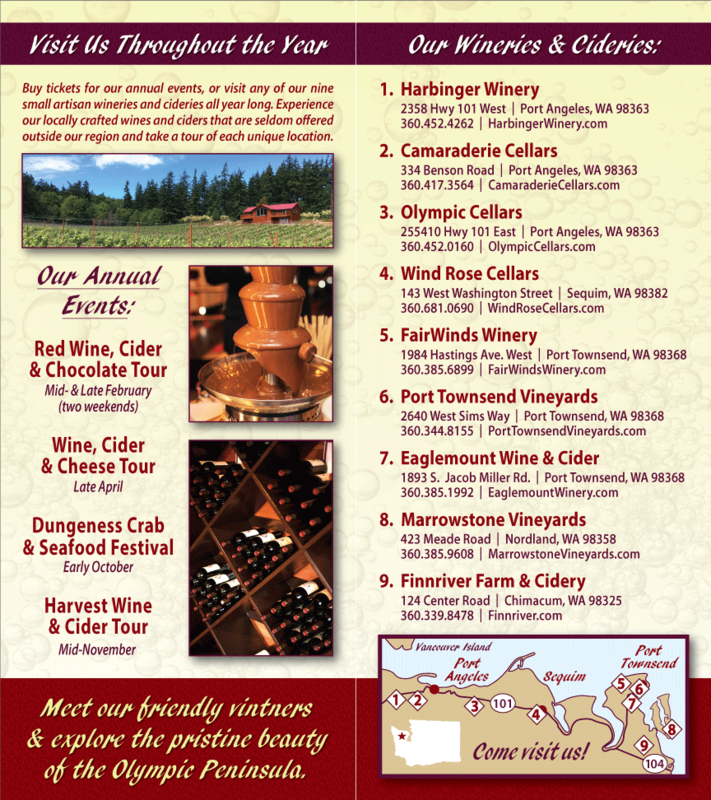 Join Washington State Wineries and Cideries on the Olympic Peninsula for the 2012 NW Wine and Cheese Tour, April 14 and 15. Read on for a list of what not to miss. Additional information is available on our Olympic Peninsula Wineries Events page. Sip 2007 Syrah and Muller Thurgau with three types of Golden Glen Creamery Fresh Curd. Finish with Plum and Raspberry wines. Sip Trinquer, a delicious white blend, and nibble amazing blue cheese cookies from Spoonful Caterers. Try the newly released Malbec with several cheeses from Wilapa Hills Creamery. Sample the new Cabernet Sauvignon and hard cider. Try Back Country Creamery’s Trailblazer with a glass of Gewurztraminer. Enjoy Summit House with a glass of the Cabernet/Merlot blend. Discover the wonderful combination of Camp Chego and Mead. Enjoy spring goat cheeses from Mystery Bay Farm with glasses of sweet wine and sparkling cider. Try the 2010 Rose with any cheese. Sip the Reserve Syrah with cheddar aged near the banks of the Samish River. Pair Raspberry Bliss (made from locally grown berries) with a smokey blue cheese from the Rogue Valley. Enjoy the 2008 Cabernet Sauvignon with Golden Glen Creamery’s Double-Cream River Cheddar. Try the 2009 Chardonny alongside a Wine and Cheese Soup and artisan bread with Golden Glen butter. Sample a variety of Black Sheep Creamery cheeses with the 2011 Pinot Grigio, the 2010 Barbera dry rose, and the 2010 Dolcetto.